Gordon Greb's 1958 Journal of Broadcasting article, the "Golden Anniversary of Broadcasting"
Herrold was a pre-Silicon Valley electronics pioneer. Born in 1875 in the Midwest, he grew up in San Jose, California and attended Stanford University. In 1900 he set up an electrical manufacturing company in San Francisco, but when the 1906 earthquake destroyed everything, he moved to Stockton and taught at a technical college. 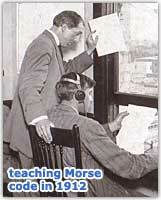 He returned in 1909 to San Jose and opened the Herrold College of Wireless and Engineering. Like Lee de Forest, Reginald Fessenden and other better known inventors, Herrold was interested in inventing a radiotelephone system that would make him rich and famous. And while his contributions to the technology of the radiotelephone were lacking in scientific originality, his device did allow him to broadcast, and he received six U.S. patents for the system he and his students used to broadcast. His technolgy used DC arcs burning in liquid, modulated by a water-cooled carbon microphone. 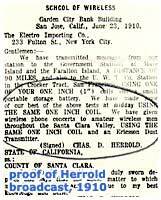 Herrold's early use of a radiotelephone to "broadcast" to an audience is found in this notarized statement by Herrold, published in the 1910 catalogue of the Electro-Importing Company: "We have given wireless phone concerts to amateur wireless men throughout the Santa Clara Valley." 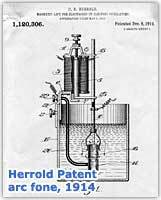 "It was a religion for 'Prof' Herrold to have his equipment ready every Wednesday night at nine o'clock. He would have his records ready, all laid out, and what he wanted to say. And the public or listeners, it became a habit for them to wait for it," said assistant Ray Newby in 1959. In 1921, RCA historian George Clark dismissed all first broadcaster claims prior to 1920 because "ordinary citizens" could not buy radios until KDKA and therefore men like Herrold and de Forest were not really broadcasters because their audiences were amateurs, not "citizens." 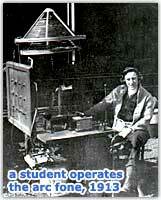 Nevertheless, Herrold was the first to use radio to broadcast entertainment programming to an audience on a regular basis. He was not the first to broadcast pre-announced to an audience, that was Fessenden in 1906; he was not the first to broadcast election returns, that was de Forest in 1916; he was not the first to get a broadcast license, that was Conrad in 1920. 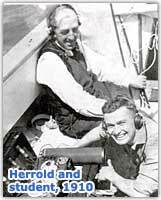 Herrold returned to the air in 1921 licensed as KQW, ran the station until 1925, and later specialized in radio advertising. 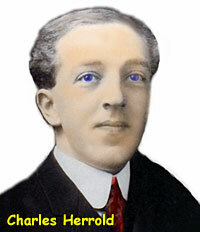 He died in 1948, unknown and forgotten. KQW became KCBS in 1949.